it from the air like this. 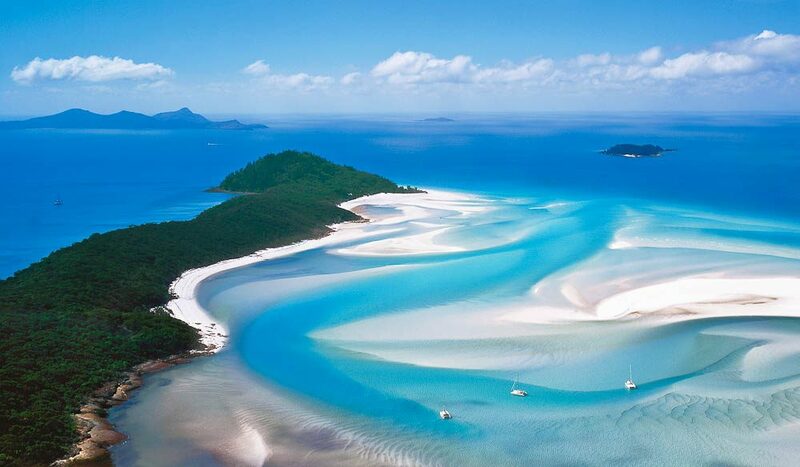 The Whitsundays offer a range of accommodation options from camping to qualia, Hamilton Island’s luxury resort, but the perfect way to experience the islands, reefs and the swirling turquoise water and pure white sands of Hill Inlet is on your own yacht – look into skippered or bareboat hires. You can anchor overnight at Tongue Bay (at the left of this picture), and walk up to a lookout at Tongue Point for a view over the inlet. Visit at low tide to see the best patterns. Whitehaven Beach stretches 7km south from Hill Inlet and is also worth pointing a camera at: it’s one of Australia’s most beautiful beaches, boasting sand of such purity you could make optical glass from it. qualia reviewed – is it still the world’s best luxury resort? Enter the 2018 People’s Choice Awards and win a trip to qualia!